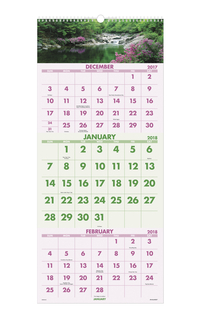 At-A-Glance Recycled Scenic Three-Month Wall Calendar offers dated planning pages for 14 months from Dec - Jan. Calendar featuring a wide-view, striking photograph on every page helps you to make an impression in your office. Each monthly page features unruled daily blocks of size 2 in x 2-1/2 in, count of days/days remaining, Sunday-through-Saturday scheduling and holidays. Each page with the middle month in darker print has a complementary background design and color scheme. Wall calendar made from 30 % post-consumer materials also includes white wire hanger, wire binding at top and full chipboard backer. Bonus page includes a current, yearly reference calendar at the back.